Sooner or later, a personal injury attorney or legal nurse consultant with a substantial practice will be asked to handle the case of a patient who suffered a spinal cord injury. 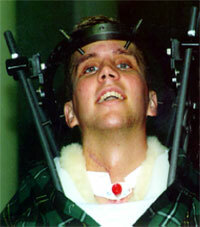 A high spinal cord injury refers to an injury to the spinal cord at a level of C4 or higher. Spinal cord injury most commonly occurs during a motor vehicle crash, but also can result from a fall, gunshot wound, or sports accident. These are devastating, costly injuries that affect all aspects of the person’s health and well-being. Careful handling of the injured person may avert some spinal cord injuries — fracture of the vertebral bodies does not necessarily injure the spinal cord. However, the profound injury is caused by shattered vertebral bodies, which push fragments of bone into the cord or a bullet that severs the cord. The muscles that control breathing are paralyzed when a spinal cord injury occurs at the level of C4 or higher – the diaphragm, the muscles between the ribs, and the abdominal muscles are all affected. Significant injury to the cord can cause the victim to stop breathing shortly after the accident. Some paralyzed individuals who stop breathing at the scene of the accident are resuscitated in time. If their crisis is quickly identified, artificial breaths given with an Ambu bag can sustain them until they reach a hospital when they can be attached to a ventilator. The Institute for Healthcare Improvement included VAP as one of the 6 patient safety issues in its initial 100,000 Lives Campaign. The Centers for Medicare and Medicaid Services is considering denying payment for VAP that develops in hospitals in 2009. VAP is now judged to be a primarily preventable infection if specific elements of care are delivered. Several proven strategies reduce the incidence of VAP. Some hospitals have been able to eliminate VAP from their facilities for two or more years. See the box. Clearly, all of these strategies, except the focus on getting the patient off the ventilator as quickly as possible, are likely to be highly successful in preventing VAP in high spinal cord injured patients. The effects of frequent VAP include the development of antibiotic-resistant organisms, lung scarring, and the risk of death. In the last two months, I have been asked to summarize the pain and suffering of three high spinal cord injured patients, all of whom were injured in motor vehicle accidents. Their ages at the time of the injury: 2-years-old, 18-years-old and 84-years-old. All three had episodes of VAP. Amazingly, the two-year-old was able to be completely weaned from the ventilator several years after her injury. The 18-year-old died from VAP, and the 84-year-old contracted VAP but died from an unrelated respiratory disease. Although these cases were summarized to explain pain and suffering, we also prepare life care plan, medical summaries, timelines, and chronologies. Call to discuss your needs.